A drum is a kind of musical instrument in the percussion group. 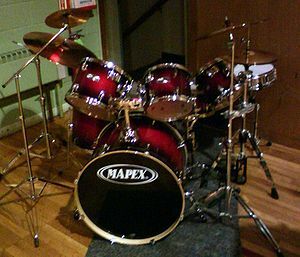 Drums are usually used for timekeeping, and to create a distinctive beat or rhythm for a piece of music, although they can be played melodically by a sufficiently skilled player. Drums are played by hitting them, either with sticks, a mallet, or the player's hands. There are many kinds of drums. Sometimes groupings of them are assembled into drum kits, allowing the player access to several at once. These kits may also be augmented with other percussion instruments, especially cymbals. This page was last modified on 11 July 2016, at 20:07.